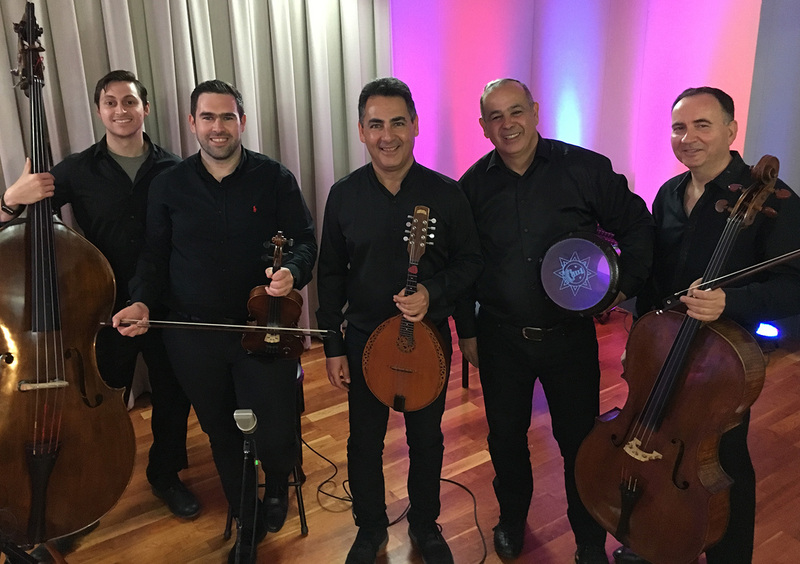 Musicians from Israel, led by international mandolin sensation Shmuel Elbaz, and ARTolerance founder and Philadelphia Orchestra cellist Udi Bar-David visited WRTI to play music of Andalusia and the Middle East. WRTI’s Susan Lewis, host. ARTolerance is a Philadelphia-based organization with a mission to transcend communication boundaries, and explore common ground, through performances, events, conferences and workshops. ARTolerance hosts musicians from Israel in programs promoting cross-cultural understanding thoughout March. Details about upcoming ARTolerance performances in the region. Sunday, March 17th @ 1 PM at KleinLife in Philadelphia; Sunday, March 17th @4:30 PM at St. Paul’s Evangelical Lutheran Church in Glenside, PA; Monday, March 18th @ 7 PM at Colonial Theater in Phoenixville, PA.
Shmuel Elbaz performs as a mandolin artist and as a conductor with all major orchestras in Israel, including the Israel Philharmonic Orchestras and others worldwide. Schmuel was the first Israeli to bring the mandolin to the front of the stage as a classical solo instrument. He has recorded the Bach Sonatas and Partitas for Solo Violin on a mandolin. Udi Bar-David, cellist and founder of ARTolerance, performs on international stages with both classical and ethnic musicians from all over the world. Born and raised in Israel, he began music lessons in Tel Aviv before coming to the United States to study with Leonard Rose from the Juillard School. An acclaimed soloist and chamber musician, collaborated with world-renowned artists, including Hanna Khoury, Wu Man, R.Carlos Nakai, and Mandy Patinkin. He has been a member of The Philadelphia Orchestra since 1997. Mosche Barsheshet, cantor and payytan, performs as soloist in the Israeli Andalusian Orchestra and performs with his ensemble around Israel and abroad. Drawn to liturgical and Andalusian poetry from a young age, he began serving as a cantor in synagogues at the age of 13, later learning to play the violin known as the Kamanga, the leading instrument in Andalusian music. Yoram Azulay serves as the musical director of the Israeli Andalusian Orchestra Ashdod since 2002, and the head of the Andalusian Ensemble. He is also musical director of the Jewish-Arab Center “Metrose,” in the city of Lod. Born and raised in Israel in a family of musicians known from Morocco for six generations. His father, violinist and Kamenge artist Yeshua Azulai, taught him the basics of Andalusian music and the music of the oud and the tamer. Spreading the Joy of J.S. Bach in the Subways of Philadelphia and Cities Throughout the World!